But in the summer of 1778, when Capt. James Cook tried to find a Western entrance to the route, his men toiled on frost-slicked decks and complained about having to supplement dwindling rations with walrus meat. The British expedition was halted north of the Bering Strait by "ice which was as compact as a wall and seemed to be 10 or 12 feet high at least," according to the captain's journal. Cook's ships followed the ice edge all the way to Siberia in their futile search for an opening, sometimes guided through fog by the braying of the unpalatable creatures the crew called Sea Horses. Working with maps and logs from Cook's voyage and other historical records and satellite imagery, University of Washington mathematician Harry Stern has tracked changes in ice cover in the Chukchi Sea, between Alaska and Russia, over nearly 240 years. The results, published this month in the journal Polar Geography, confirm the significant shrinkage of the summer ice cap and shed new light on the timing of the transformation. The analysis also extends the historical picture back nearly 75 years, building on previous work with ships' records from the 1850s. "This old data helps us look at what conditions were like before we started global warming, and what the natural variability was," said Jim Overland, a Seattle-based oceanographer for the National Oceanic and Atmospheric Administration who was not involved in Stern's project. Though earlier explorers ventured into the frigid waters off Alaska, Cook was the first to map the ice edge, Stern said. Cook undertook the voyage, which also covered the Northwest coast, on orders from King George III to seek a shorter trading route between Europe and the Far East across the top of the world. Stymied by the ice, Cook headed for the winter to Hawaii, where he was killed by native people. Stern's analysis found that for more than 200 years after Cook's visit the summer ice cover in the Chukchi Sea fluctuated, but generally extended south to near where Cook encountered it. 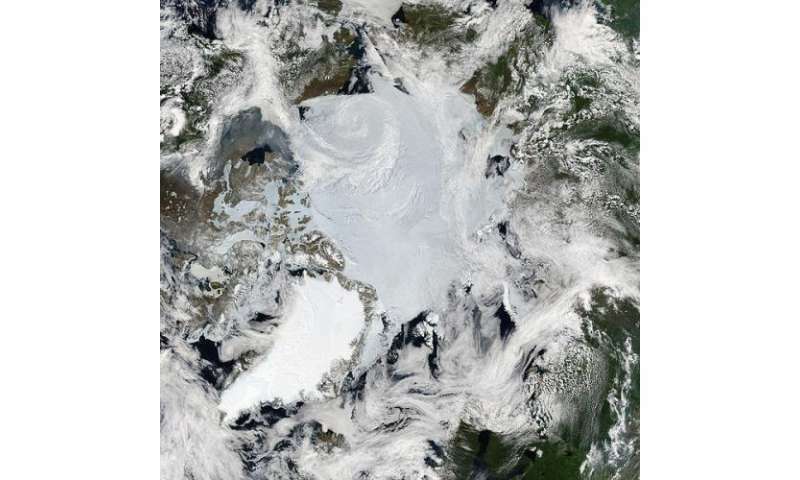 "Basically, from the time of Cook until the 1990s, you more or less could count on hitting the ice somewhere around 70 degrees north in August," Stern said. "Now the ice edge is hundreds of miles farther north." "That's probably the largest indicator that global warming is a real phenomenon," Overland said. With more melting in the summer and delayed freezing in the fall, the once-elusive Northwest Passage is now navigable for private yachts and vessels like the Crystal Serenity, which made the 7,300-mile trip from Alaska to New York in 32 days. The transformation has also triggered a rush to drill for oil in previously ice-choked watersm and an international power struggle over control of the route and resources. The tensions are similar to those in Cook's day, Stern pointed out. Nations then were eager to find and claim a Northwest Passage, while whalers and fur traders scrambled to exploit the newly opened frontier. But the data from Cook and other explorers show there were no similar warm periods in their times, said UW climatologist Kevin Wood. "It tells you that what's happening now is a fairly unique and extreme case." Wood helps run a project called Old Weather, which relies on citizen scientists to transcribe and digitize old ship's logs. Since the effort began five years ago, thousands of volunteers have processed 1 million handwritten pages from whalers, fishing vessels and U.S. revenue cutters. Historical ice measurements are especially valuable, Wood said, because existing models don't seem to do a good job of forecasting ice cover. While models predict the Arctic won't be ice-free in summer until 2050 or later, the current pace of change suggests it will happen much sooner. Cook's ice observations are also of interest to historians. David Nicandri, former director of the Washington State Historical Society, is finishing a book in which he argues that Cook - who is usually associated with Hawaii and Tahiti - was the original polar scientist. Cook also explored southern polar waters, searching for a rumored continent. Though he never found Antarctica, the experience led Cook to question the conventional wisdom of the time that held that oceans couldn't freeze and that sea ice originated in rivers. "Cook never fully got it right, but he realized there was too much ice to have flowed out of any set of rivers," said Nicandri, who was also co-editor of a series of essays entitled "Arctic Ambitions: Captain Cook and the Northwest Passage" where some of Stern's analysis was originally published. "He's never given credit for his pioneering work in polar climatology," Nicandri said. Global warming of course has been underway for the past 11,000 years. You gotta love the Mighty Wurlitzer. No context when that would muddy the message --- and confuse people. "Climate Change(tm)" on the other hand is perfect: a simple truism and therefore unassailable. Now that's great marketing! "Mighty Wurlitzer" Not the first time you've used that. What else is just canned rhetoric? Perhaps Anonym can afford a thermometer? The climate changes, regardless of mankind's activities. Worried anyway? Fear the sun. Where I am sitting was once entombed in ice more than a mile thick. How much manmade CO2 was responsible for melting all of it? How come PhysOrg posts a lot of articles that are pro climate change but not too many that challenge the theory? Probably because they post about scientific studies done by the experts in their fields, and the climate science experts overwhelmingly agree that it's happening and we're causing it. Hmmm... they have 2 data points; a log from 1778 and the most recent 36 years of satellite data. Did they check the 1903-1906 logs of Roald Amundsen who successfully navigated the Northwest Passage by ship? Or the 1940-1942 logs of Henry Larsen, who also did it? As Anonym notes, 1778 was in the middle of the Little Ice Age. It was so cold for 3 or 4 centuries that the River Thames in London froze over at least 26 times, for example in 1776 and 1788. The Little Ice Age ended in the...wait for it...late 1800's or early 1900's. Amundsen and Larsen were now able to navigate the Northwest Passage. The Little Ice Age was preceded by the Medieval Warm Period where temperatures were comparable to today. Was the Arctic navigable by boat back then? Possibly, but we have no records. Using only 2 brief time periods to prop up a theory while ignoring hundreds of years on either side isn't science. It's cherry picking. Healthy skepticism of shoddy methods is part of science, Stumpy. You cant just pick one account and say that's science. that's the same as people saying Oooh it's bloody freezing this winter, global warming must be a lie. You mock those saying "duh! one cold winter ain't climate change" Yet put out a nonsense "study" like this. I don't disagree that the climate is changing, and that we need to study those changes to truly work out the reasons and to help predict where the climate is heading. but "science" like this is just rubbish clickbait and doesn't help anyone, it just discredits those who have worked hard on this subject for many years. aaaahhh looki heeeereee... :D gorilla monkey and his shooti puppet along with a few new fresh puppets, swinging the trees today.... Lets play.... ! Can you find one that challenges the theory? Besides of amateur interpretation made by some hedge "scientist", of course. And if possible that it doesn't include references to Big foot, chemtrails, illuminati or Obama. Can you find one that challenges the theory? Besides of amateur interpretation made by some hedge "scientist", of course. You must mean "scientists" whose emails are discussed here. Humans putting Carbon into the atmosphere has a simple analogy -- if you continually urinate in your canteen, eventually your water is gonna taste like pee. Imagine if Cok had traveled there 17,000 years ago...and the wall was a mile high....one thing EVERYONE agrees on ...over the last 20,000 years things have sure warmed up. Now get back to work figuring out what caused the last ice age and why it warmed...then start figuring out how much man contributes....and lastly...what is the "ideal" temperature? And why do Warren Buffet, Elon Musk and Goldman Sachs have to make billions off the little people when we are combating "global warming"
The Pleistocene Epoch is typically defined as the time period that began about 1.8 million years ago and lasted until about 11,700 years ago. The most recent Ice Age occurred then, as glaciers covered huge parts of the planet Earth. And why do Warren Buffet, Elon Musk and Goldman Sachs have to make billions off the little people when we are combating "global warming"
When trying to make a point stick to a single idea. Our civilization wasn't there in during the ice age, so what's your point? AFAIK Elon Musk earns money from selling rockets to lift the satellites that allow you to post this stuff, and from selling expensive cars to rich people: The fact that these people are little or tall matters not. And this is actually called "fallacy of begging the question". Are we playing cherry-pick a famous physicist? Then I see your Dyson and raise you a Hawking: "We face awesome environmental challenges: climate change, food production, overpopulation, the decimation of other species, epidemic disease, acidification of the oceans."